The recent unveiling of our new kit reminded me of two polls I saw online last November. The voting took place over at the English language World Soccer News Japanese football forum, with the goal simple enough; to find the best ever J. League shirt, and the the worst ever J. League shirt. So who should walk off with both honours? None other than our very own S-Pulse! Yep, we won both the best and the worst shirt award. So let's have a look at the competition we beat off to claim these crowns. All images are from the excellent Rising Sun website which put the time and effort in to find them, upload them, and to run the polls. Urawa Red Diamonds (1993) - Shiny! S-Pulse (2002-03) - How I'd love to see a return to the days of world maps! Lovely effort from S-Pulse, and it took 22.5% of the total vote. If only I'd been in the country a year earlier I could have had one of these for my own! Well, now let's have a look at the J. League shirt hall of shame. There are some real works of art in the full poll which you can look at here. Again, here's my pick of the action! Bellmare Hiratsuka (1994-96) - My eyes! My eyes! Gloriously terrible! With a whopping 40.7% of the total vote, our 1993 away shirt trounced all opposition. What the designers were thinking (or what they were on) when they dreamt up this little beauty, I'd dearly love to know. If anyone has one they want to sell, do get in touch - I want one! There have been complaints from some of our fanbase that 2009's kit is too simple, too basic, lacking individualism. Well, for a group of supporters who have grown up with the above shirts, I can, to a certain degree, see their point. The trend towards simplism is fine, but here's hoping that five or six years down the line we see a return to the garish and outlandish shirts of the mid nineties. In the meantime, hold your heads up high S-Pulse fans, and wear your 90's shirts with even greater pride than usual - they're award winning! Thoughts on 2008 - Fuz's perspective. I should really apologize to Shizza for being left to run all the updates and whatnot here on his own. It isn't that I don't want to, but more that I don't have a job which allows lots of personal internet usage during the day. Basically, I am actually busy. Anyway. Enough of the excuses and on to the important stuff - the football. Ultimately, I was more than pleased with where we finished in the league last year given our horrendous start to the season and as more of our younger players got a chance and Marcos Paulo showed what he can really do, I started to really enjoy some of the football. Paulo without a doubt was our single most improved player last year, and as long as he isn't expected to do anything with the ball inside the box is a strong capable player - and lets face it, I love anyone who can take the piss out of the opposition single-handedly. I'm just that kind of girl. Anyone who sits within a 5km radius of me at Nihondaira surely picked up on some rather colourful aspects of the English language over the last season (and possibly some of the Scots) as frustration occasionally took over every pulse of my being. S-Pulse? Now and again it should have been F-Pulse. So many times the story was the same: we played better. We had more chances. We should have won easily... but we would throw it away and grant the opposition a point, or worse, when the teams were equally matched and we gave away the full match points towards the end. 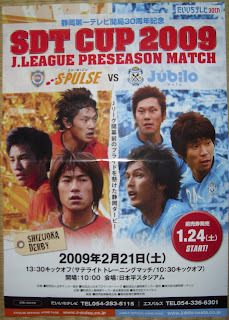 2008 was a year when S-Pulse nearly broke my heart, so many times, only to pull it all together towards the end and give us a respectable finish. I spent weeks whining about Oka-chan being on the bench and was very happy when Kenta finally saw sense and started giving the lad a place from the start. And look what happened? He scored lots and made it into the national team. I'm really looking forward to seeing what he can do in 2009. I'm sure he and our newly acquired Mr Johnsen will be the cause for more than one ロコロコ next season! Can't say I'm surprised nor sorry to see the back of Aurelio - it would have taken a lot for me to forgive him for missing that penalty, and frankly, he didn't even try. As I am a vindictive person, I am quite happy that Fernandhino ended up clubless briefly after Kyoto decided they didn't need him, and we certainly don't want or need players who don't love the jersey. Highs of the 2008 season? Consistently thumping Kashima Antlers (who really must dislike us by now) and giving Gamba another couple of doings. LocoLoco. The Nabisco Cup gave us a great run and a cup final must be the best BDO there is. Oh, and Jubilo having to fight off relegation. That gave us all a right good laugh. Lows? Losing to Jubilo, the Nabisco Cup Final and the start of the season. The Nabisco Cup final was a terrible game with a terrible result. To add insult to injury, their fans didn't even move or open their mouths until after their goal. Anticipations for 2009? Sitting in the sunny 'Daira drinking beer watching my heroes guide us to victory. Seriously though, watch this space, Kenta is forming a solid team and I think we are going to be a force to be reckoned with next season. Although rumours are already widely circulating, a date was announced today for the official release of fixtures, kick off times etc for the 2009 J. League and J. League Cup. That date is Friday, February 6th. Fixtures for the Satellite League are due to be released Feb 19th. In how many other countries do fans get the opportunity to, once a year, head to a huge event hall and watch their heroes dressed up as women performing song and dance routines? In the past I always gave the annual Thanks Day a miss, but I'm glad I was encouraged by Takumi to get off my backside and go this year. Think a small-scale festival of all things S-Pulse, where everyone is there to have a bit of fun and you can get your photo taken surrounded by the short-skirted beauties of the Orange Wave cheer leader troop. According to Nikkan Sports, around 5800 fans turned out to make it our most popular Thanks Day yet. After getting to see Nagahata in a red dress singing the theme to Ponyo, I doubt anyone went home disappointed! With food and beer on sale, I could have stayed there all day. Along with the forthcoming SDT Cup, it's another nice little way to spend a Saturday afternoon while we wait for the new season. Time for a few pics! Yours truly and Hyodo. We had a short chat, and a thoroughly nice bloke he was too. The chiselled good looks of new signing Nagai. A massive hit with the ladies, and he'll bring a few extra through the gate this year, I don't doubt! Johnsen was also a hit with the womenfolk, getting a rousing reception during the opening ceremony. Someone we're all looking forward to seeing back in action this season; Jungo Fujimoto. That new shirt collar design up close. I'm a fan. A small section of the huge numbers who turned out for a thoroughly enjoyable afternoon. I'll be there next year for sure, and with beer available from 10am, probably a lot earlier than this year! Right, enough from me, I'm off up Fuz's place for a Burns Supper. Have a good weekend! "I'm delighted to be be joining such a friendly club as S-Pulse. Even as an opponent, I could tell S-Pulse were a great club, so I'm grateful to join that. I will endeavour to play to my full potential at S-Pulse." "I'm truly happy to be joining S-Pulse. I'm getting accustomed to life here already, and creating such a good relationship with my team mates so quickly will only help us when it comes to getting results. I can't wait to get on the pitch!" 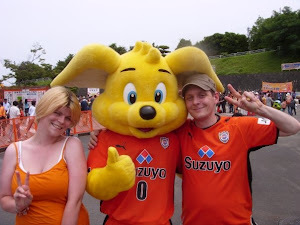 Roll on pre-season friendly with Jubilo! 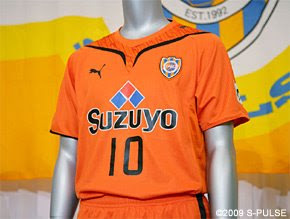 The new kit for 2009 was revealed today. Not a dramatic departure from last year, and while I'm not 100% with that funky collar thing just yet, it's still a big thumbs up from me! Every time I see a new kit, I always ask myself if I can picture our heroes lifting a trophy while clad in their snazzy new threads. The answer this year, as always, is yes, yes I can. No dates yet as to when the new shirts will be available. Jubilo decided against Hungrrrrrry (another r added to reflect yet another trophy-less season), instead opting for the predictably lame Speedy Action. This may be meant to reflect the rate at which they change managers. With Ooft off, they now have Masaaki Yanagishita at the helm; their seventh manager in five years, no less. They even went so far as to anounce their 2010 and 2011 catchphrases, with 2011 what would seem at face value a rather ambitious Road to Champion. I can only assume they're referring to their first J2 title. 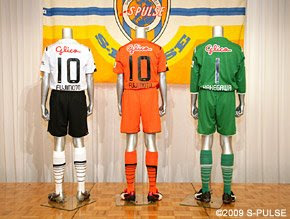 Opening Weekend: Omiya v S-Pulse? If this does prove to be the case, we can be happy with an opener against what is arguably one of the weaker sides in J1, and so three points to kick off 2009, unlike last year, is not too far out of the question. Announced last week was the latest instalment of the SDT Cup. In pre-season 2007 we played out a cracker against Marinos, which culminated in a 5-4 penalty win for us and an all-important SDT Cup crown. Next month, Saturday 21st at 1.30pm, Jubilo will be coming over to get soundly beaten by our team of young guns and experienced stars. For many of us, any game to bridge the gap before the start of the new season is welcomed with open arms. Me, Fuz and many others will be there without fail, but some may dismiss this as just a friendly and be tempted to give it a miss. For those wavering, consider not only the chance to see some of our new acquisitions in action for the first time, but also remember the opponents. We have no bigger game each season than that against Iwata, so a bonus derby should never be passed up! 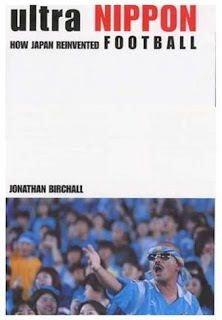 My own personal enthusiasm for this one was substantially heightened today having read the gut-wrenching, heartbreaking climax to Jonathan Birchall's Ultra Nippon. Now out of print, the book is the story of the London-born West Ham fan who followed our heroes for a year in 1999. He details with excruciating detail that night at 'Daira when we fell at the very last hurdle in our quest for a J. League title. 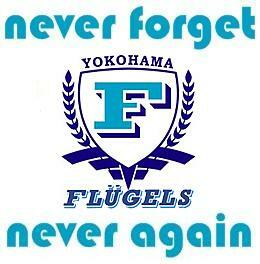 As we know, it was Jubilo who took the title on penalties, and we were bridesmaids yet again. This book was published way back in 2000 and paints a picture of a J. League in some ways unrecognisable to that of today. There are some great insights into our club back when Steve Perryman ruled the roost, and seeing how the then-rookies and then-veterans have faired in the last eight seasons makes for fascinating reading. 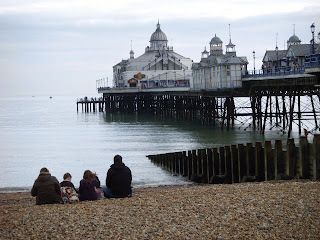 As the long, barren, football-less weeks stretch on, yours truly is back in England taking a much deserved rest by the seaside. Well, we do have the 2009 fixtures being released to look forward to, and we also have the Supporters Thanks Day a week on Saturday, but during the closed season, I always hanker for news. For that I thank S-Pulse supporting Aussie, Mike Tuckerman, for his most recent article on everyone's favourite J. League team. 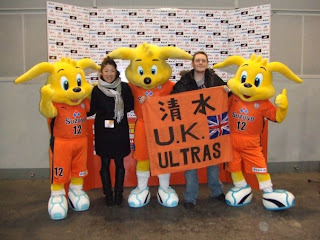 Last week, Mike met S-Pulse's press officer Naoko Umagoe for lunch, and they talked about the club's work at the grass roots level to both increase the club's fan base and nurture new talent. The former is noticeably paying off, as previously reported on these very pages. To read Mike's full article, click here. I also regularly check out another of Mike's pages, here, as he often reports on S-Pulse and J. League topics and they are always well worth reading. 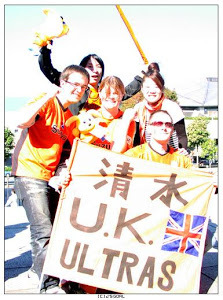 One other S-Pulse related piece I came across this week was by British journalist Jeremy Walker, and he wrote on the recent transfer incomings at Nihondaira. Read the article here. This writer also often comments on J. League and Asian football news, and is also worth a bookmark. 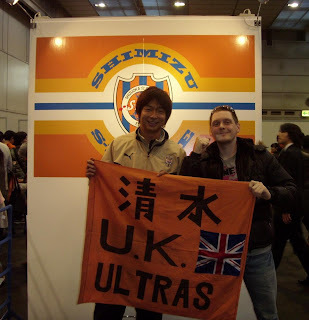 Well, while other people are busy reporting on our great club, I'm also working hard over in England to recruit more overseas fans for the best team in Japan. See you back in Japan next week! Yuichiro Nagai signs from Urawa. 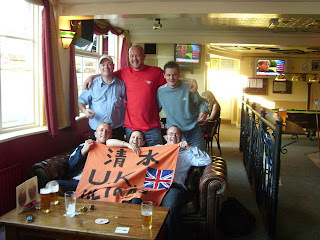 Read all about this great signing here, on fellow S-Pulse fan Mike Tuckerman's excellent site. As has been rumoured for a while, Yajima signs for Frontale. 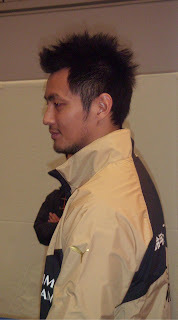 Nishizawa signs for C. Osaka (J2). Takagi to Gamba - Hiraoka back from Sapporo - Okachan a Dad! 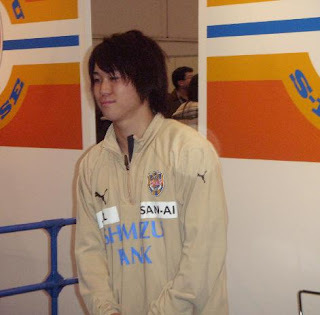 As widely rumoured for weeks, the transfer of Takagi to Gamba Osaka was offcially announced today. In other news, defender Yasuhiro Hiraoka, who has been out on loan with Consadole Sapporo for the last season, returns to his native Shizuoka. The 22 year old, who has represented Japan at U18, U21 and U22 levels, played 17 games for Sapporo last year and scored one goal. Welcome back, fella! We look forward to seeing more of you next season! An additional bit of good news I'm happy to report is that on January 4th at 12:12pm, our very own Okachan became a dad! Huge congratulations to both him and his wife on the birth of their baby boy. A future S-Pulse player, I'm sure! Ideally, I wanted a bigger logo on the back, but it appears we're limited by Cafe Press as to the size of the print. So, any feedback? Suggestions? If anyone in the J. League blogosphere has had similar experience in having t-shirts made up, any advice about the best way to go about it would be appreciated! Today Gamba beat Reysol 1-0 after extra time to claim their first professional era Emperor's Cup title and further cement their position as one of Japan's premier teams. The 117th minute winner was no work of art, but it was deserved. Regardless, and speaking from first hand experience, it must have a bitter pill for the thousands of yellow-clad Kashiwa fans to swallow. Their choreographed display (YES WE CAN in huge black letters against a yellow background) had be leaning their way before kick off! However, when the final whistle went and Gamba lifted the cup, the man their fans must have felt most grateful to was surely manager Akira Nishino. 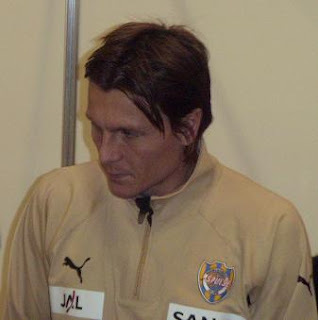 The former Hitachi (Reysol's forerunners) player took over at the Kansai club in 2002, and while it took him three years to register his first silverware, he has since turned the former perennial also-rans into a real power house. Gamba has now pulled in the league title, the League Cup, the Asian Champion's League title, the Pan Pacific Championship, the Super Cup, and now the Emperor's Cup. And all this within the space of four seasons. It's a mighty impressive haul for a team who spent the lion's share of their early history scrapping around at the foot of the table. Probably the best outcome from today's result is that Gamba gain entry into 2009's ACL - the competition they won just weeks back but were not granted the chance to defend their title. Contrast this to 2008 where the 2007 winners were dumped in at the quarter final stage, and you can well imagine how they might have felt hard done by. Well in that respect, justice has been done, so well done Gamba. Gamba's recent ascendency as one of the country's best teams is encouraging to see, as it's not been the result of merely throwing money at the squad to buy success. They don't have the best stadium in the league (not by a long shot), nor do they have the most fans (again, not by a long shot). It's just been a good old fashioned story of a team with a good youth system, back room management which allows a coach time to build a team without panicking at the first sign of a trophy-less season, and a club which is now reaping the many benefits of their patience and hard work. I like to think I can see some parallels between the way we as a club operate and Gamba, and I honestly believe the team Kenta is building won't take long to start bringing in some silverware. Indeed, looking at the last two occasions we've met the new Emperor's Cup holders, we've seen them off each time; 3-2 away in the league cup semi final, and 3-1 at home in the league. 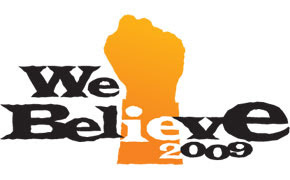 I'm counting the days till 2009 kicks off in March, (and you can too, with the new counter at the top of the page!) and we have good reason to steam into the future with every confidence! If you simply can't wait to start planning for next season, here are the key dates, as announced recently. The Emperor's Cup 4th round, when J1 teams enter, is likely to be the first weekend of November if recent years are anything to go by. Don't know about you, but I can't wait! I'll sign off with the first sunset over Shizuoka City of 2009. Happy new year to one and all - even Jubilo toe-rags! I wish you all health, wealth and fun in the coming year and season!